Labour is targeting the 800,000 people who didn’t vote in the last election (sometimes referred to as the ‘missing million’). David Cunliffe is trying to reach 800,000 voters, and if he does Labour will win the next election. They’re the ones who didn’t vote in 2011. They’re in low or middle income electorates and it’s likely most of them would have ticked Labour – if they’d made it to the ballot box. “At the 2011 election, Labour failed to persuade enough New Zealanders that it was a credible alternative,” Cunliffe posted on the party’s website. He’s making the difference between Labour and National very clear, and he’s pitching the message at those missing voters. Was it one of these non-voters who found Cunliffe yesterday? A media standup by Labour leader David Cunliffe had to be cut short this afternoon after a man in a car stopped and shouted a tirade of abuse at Mr Cunliffe and the assembled media about unemployment. 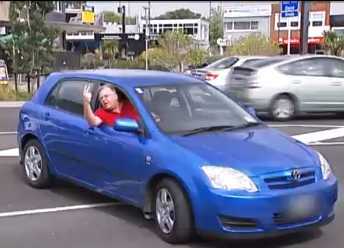 The man pulled his car alongside the press pack on the side of the road outside Mr Cunliffe’s electorate office while beeping his horn. “F*** you, f*** Labour, f**** unemployment,” he shouted. As a member of the media asked another question, the man continued to shout, saying “f*** you man, there’s no future, New Zealand’s dreaming and you’re a dreamer.” He added that National was no better. I’m tempted to reply in the same vein, that “Yeah mate, but employment IS working.” That said, it can be bloody hard to get a job when you’re in his age group. I suspect as always, there’s a lot more to his angst than meets the eye. Ive voted labour my whole voting life, but after seeing that I may change my vote……………….. reason?the leader of the labour party made no attempt to talk to this guy and find out what his issues were/are, maybe something could have been learned from this guy? In fact he sounded like he was mocking the guy at the end of the video??? Very very poor form from the party that is supposed to represent the average blue collar worker. Is a lack of interest in what this type of guy has to say what all blue collar workers in nz should expect from labour and its leader? Fair comment. He wasn’t a planned part of the photo op so he was wished away and the event was called off.